The Memorial Candle Program has been designed to help offset the costs associated with the hosting this Tribute Website in perpetuity. Through the lighting of a memorial candle, your thoughtful gesture will be recorded in the Book of Memories and the proceeds will go directly towards helping ensure that the family and friends of Albert Skinner can continue to memorialize, re-visit, interact with each other and enhance this tribute for future generations. 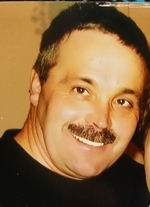 Passed peacefully away at the Health Science Complex in St. John’s on Saturday, March 24th, 2018, Albert Arthur Skinner, age 60 years of Harbour Breton. Leaving to mourn his loving family: wife, Marilyn; son, Dennis (Alice); daughter, Lisa (Lenny) all at Harbour Breton; grandchildren, Kaitlyn, Kayden, Mason, Tanisha and Tiana; brothers, Don, Cecil (Beverly), Gerald (Monie) and Roy all at Harbour Breton; sisters, Annie Bungay (Larry) at Harbour Breton and Ethel Mary at Grand Falls-Windsor; brother in law, William Cox (Charlotte); sisters in law, Joan, Geraldine (Arch Osborne) all at Harbour Breton, Marie (Harold Skinner) at St. John’s and Maude Skinner at Marystown; plus a number of other relatives and friends. Predeceased by his parents, Richard and Pearl Skinner; brother, Samuel; sister in law, Vera; brother in law, Patrick Skinner; and other close relatives. Visitation will be at Spencer's Funeral Home, Harbour Breton from 1:00 to 4:00 pm and 7:00 to 9:00 pm on Tuesday and Wednesday, March 27 and 28. Funeral Service will be held on Thursday, March 29, 2018 at 2:00 pm at Spencer's Funeral Home Chapel at Harbour Breton.